It's hard to describe love- this Barney Butter Vanilla and Espresso is just that! 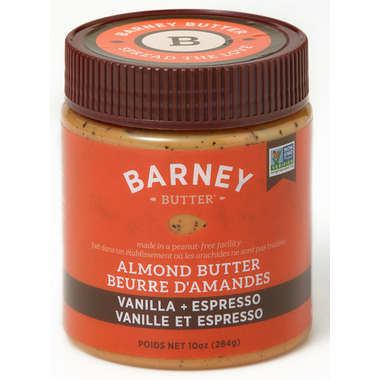 Made with Barney's blended blanched almond butter, organic fair- trade espresso and natural vanilla. This will have you hooked! Barney Butter is made in a peanut-free facility! Their dedicated facility guarantees that Barney Butter is truly free of peanut particles and contaminants. Perfect for peanut free environments like schools and airplanes! Ingredients: Blanched Roasted Almonds, Palm Fruit Oil, Organic & Fair Trade Cane Sugar, Natural Vanilla Flavor, Organic Fair-Trade Ground Espresso Beans. I wanted to love it... and I guess I wasnâ€™t really sure what to expect. I imagined it would be creamier with more vanilla flavour. Taste is ok but I would not repurchase. Soft and seriously delicious! Packed with nutritious ingredients. Best part is they only have a few ingredients! Only downfall; the jar is too small.